I was in deep woods on Michigan’s Upper Peninsula, following a large, mostly black bird that I’d hoped was a Pileated Woodpecker. I’d only had a glimpse, but it was crow-sized, and flew in the roller coaster style of a woodpecker. Plus I thought I’d seen a flash of red on its head, a head with a tantalizing, prehistoric profile. I stopped. Looked up. Quietly. And there it was, high on the side of some kind of pine (I never could identify trees in any but the most general way, finding their field guides baffling compared to bird books). It was a sizable Pileated, crested with bright red, but lacking red on the cheek, and therefore a female. I was well focused on it, enjoying the view, thinking this bird’s neck is oddly thin for its body. And then it was gone. Big as a Pileated Woodpecker is, its attention span is apparently as small as any woodpecker’s. But at least I’d made a positive ID and could put it on my list, a bird I’d never seen before and was unlikely to find near Chicago where I do most of my birding. Wait. Something else was there. 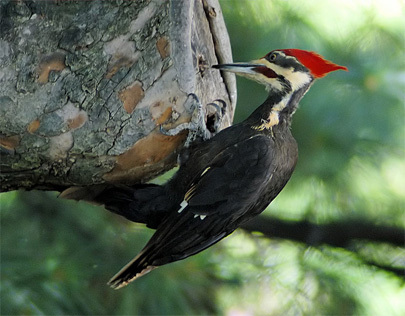 There was something round and dark in the tall pine above the spot where the Pileated had clung with its splayed four-toed feet and stiffened tail. I focused my binoculars upward and stood with my mouth open, fascinated by a good, long sighting of the first porcupine I’d ever seen. That was a turning point for me. Since then, I watch for more than birds when I go birding. I’ve found that when you put yourself in a landscape where interesting birds are likely to be seen, you’ll increase your chances of sighting all sorts of unexpected wild things. And you don’t have to be in serious wilderness like Michigan’s U.P. It works in the suburban forests I like to walk in every weekend, forests that feel as deep and smell as good as Michigan’s, even though they’re within the sound of traffic moving on roads no more than a few miles away in any direction. Actually, I think that wildlife sightings in such semi-domesticated settings are even more exciting. They represent something encouraging about ecological diversity in the face of unstoppable human land development. I was moving quietly through old trees at the Ryerson Conservation Area, a nature preserve on the Des Plaines River north of Chicago. My attention had been captured by two Downy Woodpeckers. Or maybe they were Hairy Woodpeckers, identical in every way to Downys but size, so you never know if you’re seeing a biggish Downy or a runty Hairy. They were colorfully red-capped males who were agitated by each other’s presence and alternated working the same tree, playing out some kind of avian territory game. I stopped to watch, leaning up against a thick tree, probably an oak, but don’t ask which variety. My brown leather jacket, dark beard and hair somewhat camouflaged me, I suppose, and I settled in to stay a while. The forest floor was yellowish with fallen leaves, and the light that came through the canopy had a golden cast. It was a nice moment. Leaves were floating down everywhere with implausible regularity, as though in an animated Disney film about Fall. Sometimes, what appeared to be fluttering leaves turned out to be impatient Fall kinglets, both Golden-Crowned and Ruby-Crowned, surprisingly small and remarkably unafraid of people. But the usual kinglet indifference to visitors was irrelevant on this occasion, because after several minutes, I’d already blended quite well into the woodscape, motionless and color coordinated as I was. Even the woodpeckers came so near at one point, they were too close to be seen through binoculars. I let my arms hang at my sides, and became part of the tree, inhaling the forest’s cool musk, not thinking, just being. I was enjoying the same kind of high that people who fish tell me they get on the water, a mixture of Zen and the human hunting instinct (benign in birders, but very much there). A patch of grayish tan against similarly colored trees. I kept my binoculars down. I’d seen White-Tailed Deer at Ryerson before, and knew they normally hang out in small groups which will panic at the sight of a person, their tails high, flashing bright white undersides as they jump away in unnecessary panic. The deer I saw would surely be unaware of me. Who knows how close it might come? I remembered reading somewhere that aboriginal Americans considered it a feat of skill and maturity to become so invisible that they could touch a wild deer as it moved past them in the forest. I had no intention of doing that, but I did hope the deer would come closer. Soon I could make out the shapes of other deer slowly grazing near the one I’d first noticed. I’d been right to expect a group. And I was pleased to see they were indeed making their way in my direction. I relaxed into the side of the big oak. Suddenly, up went one tail, its white underpart facing away from me. The deer was looking behind it, in the opposite direction from where I stood. Then another tail shot up in alarm. And the group, four mature females–large, but antler-free at a time of year when males would be fully racked–began running in my direction. Most penetrating noises I’ve heard in the woods have been human-made. It’s always surprising and disconcerting how clearly our voices carry through the forest. But this time, loud careless noise was coming from animals, big animals moving at speed. Forest litter crunched apart under their hooves. Low-hanging branches swung and cracked as the deer rushed with senseless urgency, right toward me. 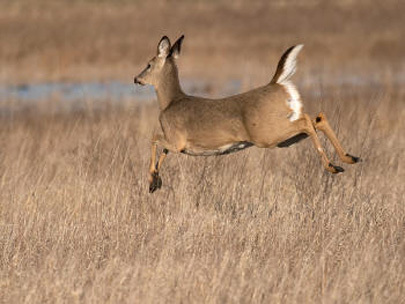 One leapt especially high, as though going over an invisible fence, and I recalled a PBS documentary showing Thompson’s Gazelles, I believe, doing what the narrator called “pronking,” this same surprising jump in the middle of a run. Perhaps in Africa, with predators all around, such maneuvers are important. But in Chicago’s suburbs the action seemed melodramatic. Then I saw that something was running with them. It was close enough to be part of their group, but somewhat behind. My first impression was that it was chasing the deer, although I didn’t believe foxes–meat lovers though they may be–go after such oversized prey. I had to assume the fox must be running with the deer, perhaps all of them fleeing in unison from something I couldn’t yet see. I looked beyond the deer and fox to see what might have scared them. There was nothing, no one, in the woods but us. Then the deer nearest the fox at the rear of the pack pronked, a towering bound that took it well away from the little animal. Immediately, the fox, its skittering feet throwing dead leaves wildly into the air, turned sharply and ran even faster toward the next nearest deer. The fox seemed to be chasing them. Not close enough to touch, but closer than I’d ever been to so much authentic wildness. I could hear their breathing, surprisingly human, like kids on a running track in high school. I could see that the deer had wet, runny noses. Even though the red fox was appropriately reddish, it had black, gray and white hairs, too, giving it a multi-colored appearance which I felt privileged to see. A kind of inside information. Its black eyes were shining in the yellow light, causing in me a momentary childhood recollection of bizarre fur pieces owned by elderly female relatives, garments composed of whole pelts with plastic eyes and pathetic clawed feet, somehow connected like link sausages and worn around the shoulders. Then they were gone. I leaned forward, looking after them. Nothing. The only noise was the occasional small, hoarse croink of the same two Downy or Hairy Woodpeckers, still concerned over each other’s claim to a piece of bark. Their call was kind of like that of the Belted Kingfishers I’d occasionally see at the west end of Ryerson, where woods border the brown river. I wondered if somewhere on their family tree woodpeckers are close to kingfishers. Kingfishers do have that overlong and powerful bill. And some woodpeckers are crested, rather kingfisher-like, as was the Pileated I’d seen in the North Woods. I looked in the other direction, the one from which the deer and fox had escaped. Was there another hiker in the woods, someone who’d spooked the animals? I moved away from my tree in that direction, sure I’d soon hear or see another person. Perhaps, it would be someone with a dog sending out predatory vibrations, scaring the wildlife in its path. Although Ryerson’s entry signs say pets aren’t allowed, I’ve seen them there several times. But five minutes later, and well into another part of the forest, I’d seen no one, no sign of anything that might have alarmed the animals. The naturalist in charge of Ryerson Conservation Area later told me it’s unlikely that a fox would chase deer, and that the explanation must be (as I’d expected to hear) that they were coincidentally running together, away from some perceived threat they all shared. I don’t know. But I remember how that fox veered toward one of the running deer, the one closest, its heels almost in biting range. And I know how it looked. The incident upstaged the woodpeckers and kinglets, and I’ll never figure it out. There was news of a White-Winged Crossbill in those same woods, high in some kind of fir that my tree guide says only grows in the Pacific Northwest. The tree’s more uncommon around here than the crossbill. I never did spot the bird, a rare winter visitor not on my list yet, but I did find beaver sign near the river. There were gnawed, pointy tree stumps and bright wood shavings all along the bank. Here was evidence of another nearly extinct animal making a comeback, regardless of increasing human development. White-Tailed Deer, the kind I saw, are perhaps the best example of wild animals doing this. I recently read that in the 1950s, there were virtually no deer in the Northern half of Illinois. 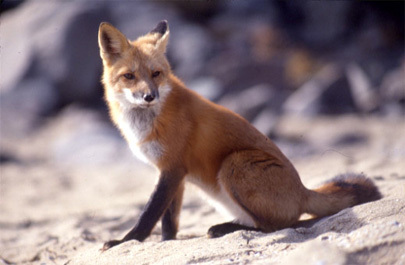 Today, they’re nearly as common as squirrels, and have even become backyard pests during Fall and Winter. Ryerson Woods–a conservation area–has had to resort to trapping some for relocation, and even employing all-too-willing marksmen to shoot double-digit numbers of deer in order to keep populations of important native plants from being eaten to extinction. In addition to deer and beaver, these suburban woods, rivers and fields now have unexpected numbers of red fox, mink, woodchuck, chipmunk, raccoon, skunk, weasel, pygmy rattlesnake and even coyote. In fact, last winter at least three coyotes were captured in Chicago’s very urban Lincoln Park amid skyscrapers and boulevards. I wouldn’t be surprised to hear that some day porcupines, black bears and even cougars will have worked their way down wooded river systems northwest of here and come into our suburbs. This is known to be the same route that deer and beaver took. Perhaps these animals don’t always just disappear when human development constricts their natural, preferred environment. Some might well live on. And true to the principles of natural selection, the survivors may gradually produce individuals that prosper within a landscape of only intermittent wildness, co-existing with highways and housing developments. Later that year, I managed to get some close-up sightings of Red-Bellied Woodpeckers at Ryerson. I saw a brightly colored Evening Grosbeak, and an owl flying from one bare branch to another. It was silhouetted against the dusk sky and too far for a clear identification except to say it was an owl, with upstanding ear tufts blowing in the wind. In mid-winter there were a surprising number of Robins there, sightings I consider exotic only because, unlike the Robins of my pre-greenhouse-effect Chicago childhood, these don’t migrate any more. And as spring plants greened along a small creek in Ryerson, I saw a coyote and it saw me. We shared a moment of eye contact before it turned casually and disappeared into the foliage, walking with that distinctive stiff-legged coyote walk I’d seen on others of its kind when visiting Yellowstone National Park. But this one was fifteen minutes from my home. Bird watching has never been more interesting. This entry was posted on Tuesday, June 9th, 2009 at 9:24 pm	and is filed under "Viewpoints". You can follow any responses to this entry through the RSS 2.0 feed. You can leave a response, or trackback from your own site.